Available in: 5 lb. through 125 lb. in 5 lb. increments. Sold only in runs of 5-50 lbs., 55-75 lbs., 80-100 lbs., and 105-125 lbs. 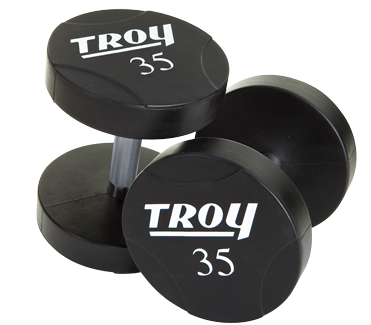 These urethane dumbbells have a solid steel design which offers one of the most compact dumbbells in the industry. The 32 mm handles are a hard chrome finish which will not flake or peel and the urethane is odor-free and will protect floors and equipment. Solid steel handles are press fit completely through the steel slug and then welded on the outside to provide a totally maintenance free dumbbell.